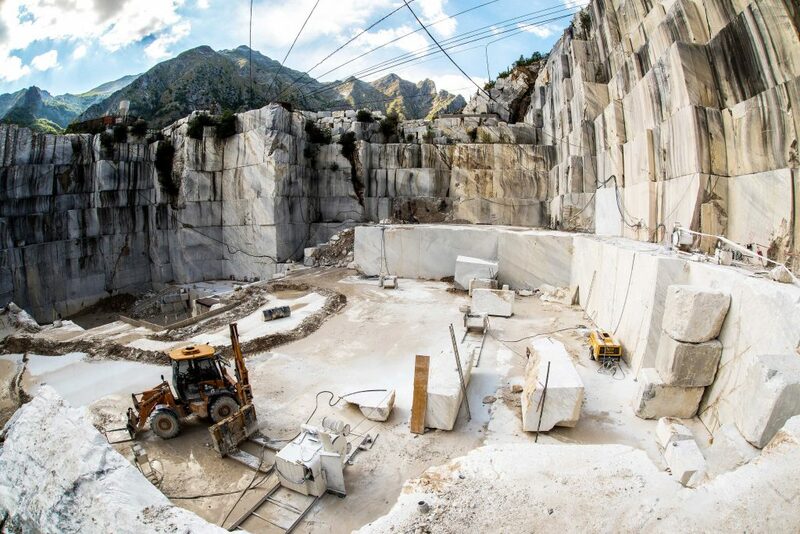 What began as an adventure has been transformed, 60 years later, in an entrepreneurial reality among the most important ones in the Italian stone industry, and it is the most important in the Tuscany Region. Cooperativa Apuana has modern and efficient infrastructures and runs a storage facility in Isola di Roccalberti – Camporgiano (LU) in which visitors can choose and appreciate the wide range of available products. The large, very old extraction basin is divided into four operating sites from which different materials are excavated. Every year, Cooperativa Apuana extracts 40.000 tons of ordinary and colored marble, it means that the annual sales exceed 10 million of euros. There are more than 70 people working for Cooperativa Apuana, including workers and employees; the Administrative Board is composed by 7 members. The production is made by marble blocks; the major part of them is destined to the foreign market, especially Libya, Tunisia, Morocco and Middle East Countries. A partnership with a reliable transport company guarantees on-time, efficient delivery. In 2015, the Company decided to take another important step building a state-of-the-art plant for the first transformation and production of semi-finished products, destined to both suppliers and final users. The choice was to create a new and ad hoc company, with commercial partners who knew well the peculiarities of Cooperativa Apuana’s marble, so consequently Apuana Lavorati srl was born. The sawmill has been inaugurated at the beginning of 2018 and it has cost almost 6 million of euros. It is one of the most modern and well-designed marble processing plants in the Apuo-Versilian area and it allows the production of meshed, resin-treated and polished slabs, even on behalf of third parties. 1 BRETON polishing line with facilities for loading and unloading blocks. Moreover there is the possibility of installing an additional frame and an automated cutting line in order to obtain finished products. The creation of the New Headquarters of the Apuana Marmi Vagli Cooperative is the result of a complex and rigorous process, during which a principle was constantly kept in mind: everything had to start from the material, marble, read and interpreted in its deep essence, to be then explained in the forms, ways and techniques of Architecture, according to a contemporary language. 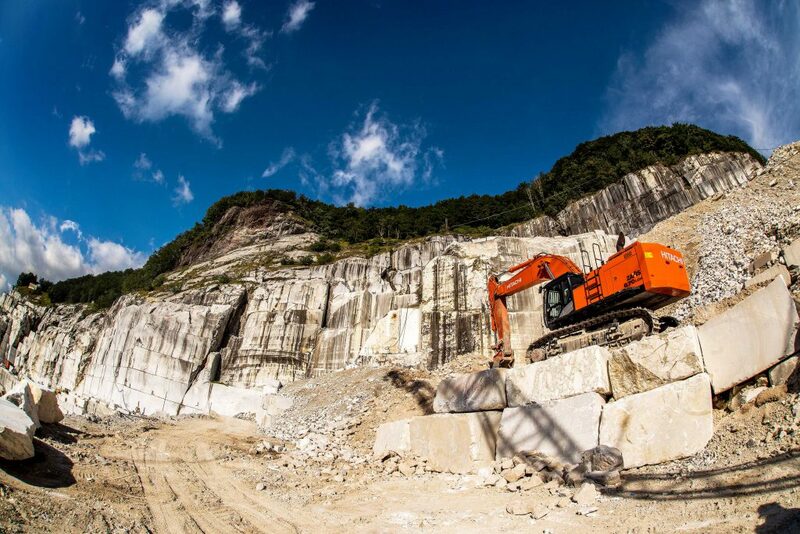 Starting from 2015, the expansion projects of Cooperativa Apuana lead the Company to acquire holdings in other strategic realities of the local stone industry, above all Garfagnana Innovazione srl. This Company was born in 2011 as a project of the municipality of Minucciano (LU), initially it was under the management of GAL – Garfagnana Environment and Development – and then it has turned into a spin-off. 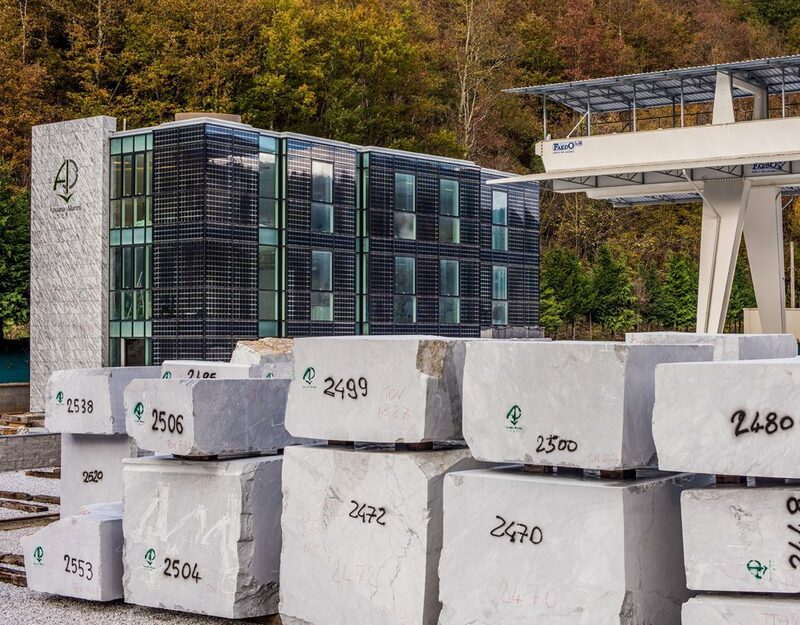 This path toward the use of technology for marble-working has been taken in order to increase the level of employment and development for the whole Garfagnana area, as well. 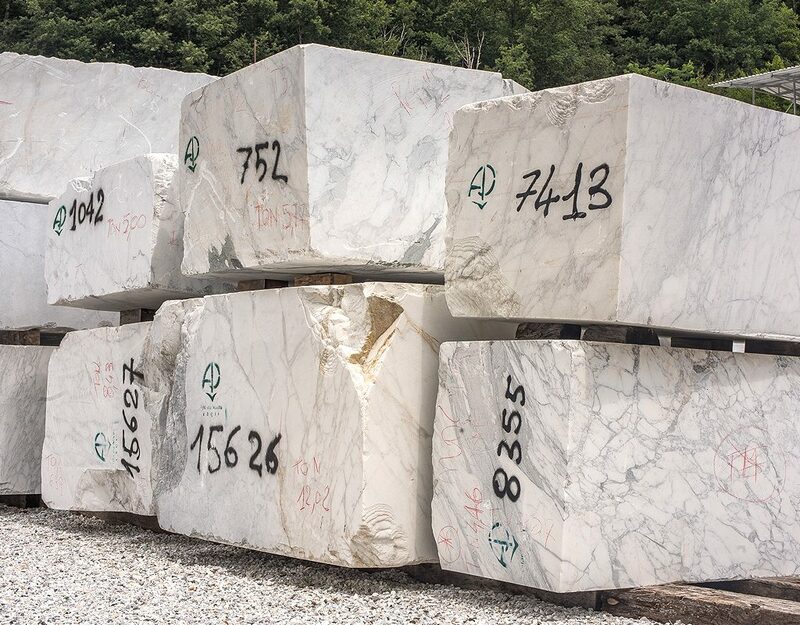 The use of highly specialized personnel allowed to realize a short supply chain able to combine advanced technologies with manual and traditional skills in the marble processing. Garfagnana Innovazione srl, with robotic 3D scanners, anthropomorphic robots and CNC centers, represents the top – level of technology. Inside the headquarter they have equipped spaces that are allocated cyclically to different companies of the stone industry in order to facilitate the start of new commercial activities. Great importance is given to the educational and learning activities, first of all in collaboration with the Digital Stone Project: an American Foundation that gather together the best American Universities. Every year they plan sculpture workshops. 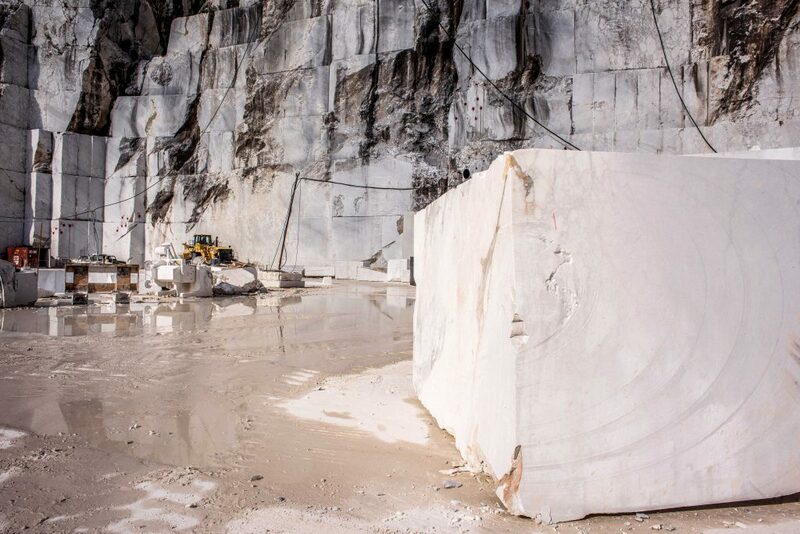 Calacatta Fiorito® extracted from the Borella quarry located in the municipality of Vagli Sotto (LU), as well.